Hirene is a Scythian, Srayanka’s trumpeter and battle partner. This is probably not the place to explore ancient views of sexuality — my feeling as an historian is that our attempts to study the sexuality of the past always says more about us than it does about the past — but for what it is worth, Hirene is what we’d now call “gay”, meaning mostly homosexual (lesbian) in her orientation, as one might expect in a society of warrior women where pregnancy spelled the end of your military career. Hirene is also tough as an old sandal and very capable, and suspicious of Kineas when the other Scythians are more welcoming — perhaps from jealousy, or perhaps from a sensible instinct for Kineas’s power. For what it’s worth, my character of Hirene (and she really doesn’t get the page count she deserves) is based on my first riding instructor, who was neither gay (that I know of) nor much inclined to war — but had iron gray braids and could ride anything that moved, and was justifiably amused by the pretensions of young men. I thought the world of her. Herodotus, the father of modern history and an all-around know-it-all, said that the Scythian priests sacrificed their manhood to achieve shamanistic power, and lived as women. I found that a pretty compelling picture, especially as it had parallels in the Native American world, and when I saw some archaeological evidence for such a person, I was all the more interested. So, for the record, as I’ve been asked — no, those aren’t mis-prints. Kam Baqça is a man — at least born — and has trans-gendered to live as a woman. As the reader will discover, she has a daughter, Nihmu, from when he was a married man and a warrior. The complete life change required by the way of the shaman is well attested in ancient and modern sources, and I wanted to have a character with the same power — and sense of doom — that I saw in Herodotus. In addition, Mircea Eliade’s seminal work Shamanism, Archaic Techniques of Ecstasy had a major impact on the character of Kam Baqça and on the shamanism practiced in Tyrant and Tyrant: Storm of Arrows as well as on the dream cycles experienced by Kineas. A note on the fine line between fantasy and reality, or between Fantasy and Historical Fiction. As a writer who loves history, I try to portray the people in my books as they would have seen the world. They, quite clearly, believed in the power of dreams and the shamanistic world, the law of correspondence, oracles, and other naturalistic philosophies now deemed either superstitious or relegated to the fringes of our rationalist/Judeo-Christian society. I had the pleasure (well, sometimes it was a pleasure) of growing up with a Native Seneca man who believed deeply in the power of dreams and in the “magical” power of the natural world around him, while remaining utterly pragmatic in his approach to earning a living or fighting a war. The strength of his belief was a revelation to me, and I’d like to suggest to my readers that every event in my books will have a rational explanation — and yet, it is also possible to suspect that “there are more things in heaven and earth than are dreamt of in your philosophy.” I don’t ask that you believe in oracles — merely that you accept that they believed. Marthax is the warlord of Satyrus, King of the Assagetae. Marthax is fifteen years older than the young king, and has military experience far beyond his lords, having fought Macedon in the 339 campaign under Ataelus and then served in the many border wars since. However, it’s worth noting that even as a barbarian war leader, Marthax’s experience would be much less than Kineas’s. Kineas has been at war since he was fourteen; he has served in seven or eight major battles, as well as innumerable skirmishes, whereas, unless the Scythians had an unusual problem (like Phillip II in 339 BC) it was unlikely that they would see a pitched battle more than once in their lifetimes. However, the constant tribal raiding that was a feature of Scythian society made them expert on the small unit level, and it is at this form of warfare that Marthax excels. Kam Baqça’s daughter, Nihmu, is another high-caste Scythian character, this time representing the relative assimilation of many Scythians with the Greeks. Nihmu is already accepted as a religious figure in the temples of Olbia by age twelve, and has taken in many Greek religious ideas about divination, while remaining at heart a Scythian. She is an oracle — that is to say, she does not always speak prophecy, but Kineas often hears it when she is around. In addition, she is also a young woman out to prove herself, and so she serves with Ataelus’s Prodromoi in Tyrant: Storm of Arrows. Finally, she is a healer, as most female priestesses seem to have been. Old Persian “Dark Haired Girl.” Samahe’s name represents one of the many problems of recreating the world of the Scythians — names. As far as I could tell, we have about twenty actual Scythian names and about ten words of their languages. There’s still argument in academia about whether Scythian is an Indo-Iranian language via Ossetian and Sarmatian, or something else. I went with the Iranian/Sarmatian/Ossetian scholarship for two reasons — first, because it was easier that way, because I could take words from Old Persian and adjust them; and second, because the ties between Ossetian legends and the Arthurian cycle delighted me! Cuyler Young firmly believed that the Scythians were an Iranian people, and I went with his vast (truly vast) knowledge on the subject. Samahe is a normal Scythian girl — not a princess, not a great warrior nor even a spear maiden, but just a girl in her adolescent years serving as an archer in the “army.” However, her marriage to Ataelus and her own capabilities cause her to rise to be a tribal leader and, in effect, an officer of Kineas’s “scouts,” the Prodromoi. Like Leucon, Satyrus is part historical figure and part fictional creation, and both of them share some common roots, for all that they’re deadly enemies in Tyrant. Right until the end of the Classical era, the Scythian tribes remained powerful around the Bosporus and remained allied to the kings there. We know very little about the relationship between the Scythian kings and the archons of the cities or the Kings of the Bosporus, but at times they were the same people and at times they must have been different. 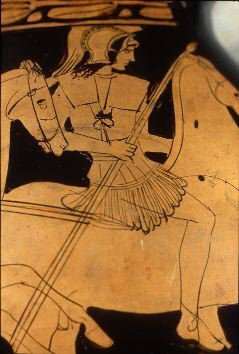 Satyrus is Ataelus I’s sister’s son, as I believe that Scythians were matrilineal (go ahead, prove me wrong!). Whether Ataelus I won or lost against Philip II, the battle was disastrous for both sides, with a high death rate, and nomadic societies cannot take casualties like settled societies. (I suspect that the equality of Scythian women developed from the necessity of putting them in the field as warriors.) Satyrus has to rebuild the Assagetae (my created name for the coalition of the tribes of the West) and lead them in war at a very young age.